Introducing Inovativ's latest Apollo cart's. The Apollo incorporates a newly designed shelf system that easily assembles without tools and includes our first internal Main-Frame system covered by a sub-panel. The shelves have been made 56% thicker. The upright tubes secure with such strength and durability, using our new Corner Cam Lock System, that the Apollo is more than 40% stronger than the Scout series equipment carts. 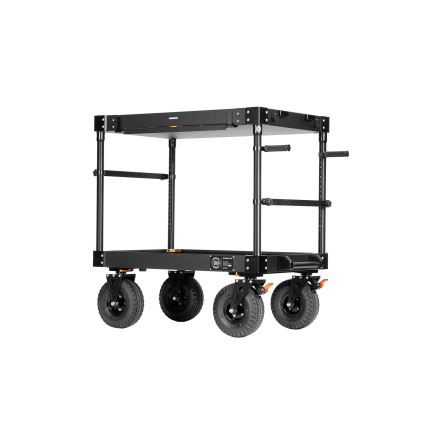 In addition, the four vertical posts have been made 14% thicker and mounted to the widest points on the cart making the Apollo the most stable and durable cart to date, and easier for latching down to the walls of a production truck. The top shelf has a built in low-profile foldable side panel that stows out of the way with ease. This gives you easy access to load and unload equipment or spend long-days managing data using computer workflows. 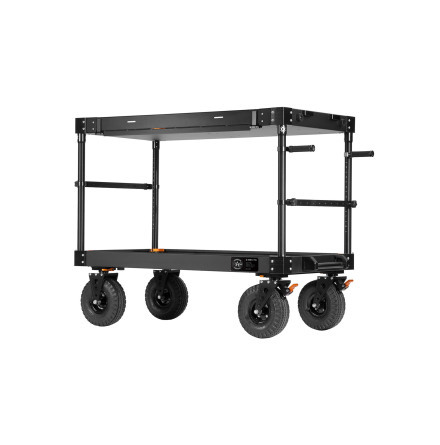 The carts latch system, connecting the two shelves when collapsed, has been moved to the short sides of the cart and easily stows out of the way when the cart is in use. The Apollo is less than 20 cm thick in its collapsed configuration.